Attorney Jacqueline D. Opyd grew up in the south suburbs of Chicago and she attended Victor J. Andrew High School in Tinley Park. She graduated from the University of Illinois at Urbana-Champaign from where she earned a Bachelor of Science in Finance with high honors. After college, Jacqueline obtained her Juris Doctor from IIT Chicago-Kent College of Law. 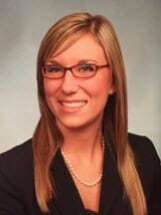 During law school, Jacqueline interned for the legal clinic in Chicago-Kent and later wrote successful brief arguments presented to the Illinois Appellate Court in a real estate tax dispute. Following law school, Jacqueline's legal career has been centered in the south suburbs. In her positions prior to joining Frankfort Law Group, Jacqueline has gained invaluable knowledge and experience helping local clients with real estate law and transactions, real estate title work and clearance, bankruptcy law, foreclosure, eviction, debt collection, probate and trust administration, estate planning, guardianships, contested estates, family law, business law and contract law. Her experience in various areas of law has given Jacqueline a unique understanding of how legal matters from these areas often coincide and interact with one another. Jacqueline believes in providing clients a high level of service and maintaining great client relationships. She fights hard for her clients to get the best result possible. Above all, Jacqueline wants to help people. She uses a "down to earth" approach with client communication and representation as she feels clients deserve to be informed about their case in a manner that they can understand. Jacqueline lives in New Lenox with her husband and young son. Besides spending time with her family, Jacqueline enjoys cooking and baking, staying active and spending time doing just about anything outdoors.